12 26 Update this item sold out today. We may bring in a few more later this week. There are two stockings featured here. 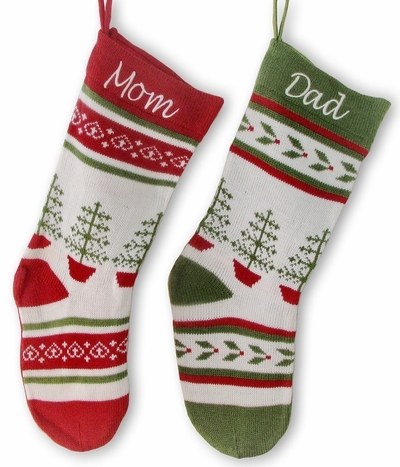 They are hand knit styled stockings with the little boot cover and toe cover like a child's adorable sock with Christmas tree design band across the middle of the stocking. These are Knitted Christmas Stockings with a choice of 2 designs so you can make a set. The listing and price is for ONE STOCKING. We are showing two stockings hanging together so you can envision what a set would look like when you choose some of each color. Measured This knitted stocking measures 21" long along the diagonal from the top of the cuff to the toe; and the width across the cuff is 7". Materials: Authentic wool and polyester blend knitted Christmas stocking. The knit is a front part only the back side is made from matching nice quality felt. The felt on the back keeps the stocking from stretching so it looks nice when you stuff it with presents. We have pictured the back of the stockings in the additional images. Lining: This stocking is is not lined inside. The back felt stabilizes the stocking.